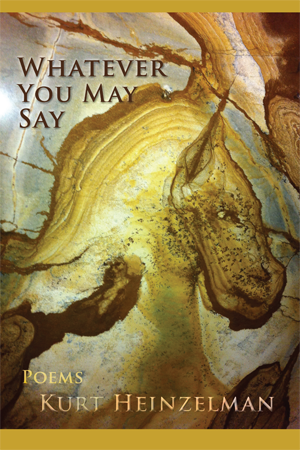 Whatever I may say about Whatever You May Say has been aptly said by a variety of poetry reviewers including Wendy Barker, a John Ciardi Poetry Prize winner, and Steven Weinberg, a Nobel laureate in Physics, but I add my voice to those illustrious reviewers in praise of Kurt Heinzelman’s newest book of poems, Whatever You May Say, published by Pinyon Publishing. I have lived in El Paso, Graham, and Electra, Texas and spent two weeks at Alpine, Texas writing Texas haiku and was drawn to Heinzelman’s “Lone Star Haiku” section. Simple haikus in which Heinzelman merely recites the names of Texas towns I’ve visited resonated with me: “Boerne. Bandera/Seguin. Sugarland/Flower Mound/ Gruene,” and as the former spouse of a petroleum engineer, this one brought up memories of west Texas oil fields: “Old donkeys pump/a subtle field/sandhill cranes are grazing.” And this wry, dash-laden haiku entitled “Emily Dickinson in the Hill Country:” “Roadrunners—skip/Armadillos—hop/Jackrabbits — cower.” Heinzelman also covers more terrain familiar to me in “Hill Country:” country of hard scrabble,/scrub brush—outcrop/chafed by drouth…landscape/like an angry throat/hunting for milk…” He captures Texas landscapes like a transplant that has succumbed to the beauty of broad expanses of the Lone Star State, and as an admirer of Texas landscape and culture, I delighted in this section of Whatever You May Say. A sad memorial to Malaysian Airlines Flight 17 shot down over the Ukraine, an act that was backed by Russian separatists, is entitled “Bodies Fallen in Fields of Sunflowers,” an intense and harrowing poem that embodies Menand’s idea that a poem changes its readers. The poem moves readers with its history of beautiful flowers that “once in full bloom/their faces stop turning/to follow the sun…three millennia before Christ/America’s native people/cultivated these flowers of the sun…” The poem reminded me of a good friend who planted a field of these tall, bright-faced flowers, and we enjoyed fresh faces until she grew tired of weeding and watering and they passed on, the memory of them refreshed by Heinzelman’s tribute. Whatever Heinzelman has to say will perhaps touch and change readers’ lives with lyrics about a broad range of subjects from spare haiku to musings about the mysterious world of the unconscious and questions about God. For those who aspire to write poetry, Whatever You May Say is a vivid lesson in the various forms and feelings that can be expressed and come alive through the art of poetry. A native of Wisconsin now living in Austin who teaches Poetry and Poetics at the University of Texas, Kurt Heinzelman co-founded two literary journals: The Poetry Miscellany and Bat City Review and served as editor-in-chief of Texas Studies in Literature and Language. Available from Pinyon Publishing, 23847 V66 Trail, Montrose, CO 81403. Again, bravo Gary and Susan. It's a blue ribbon special!